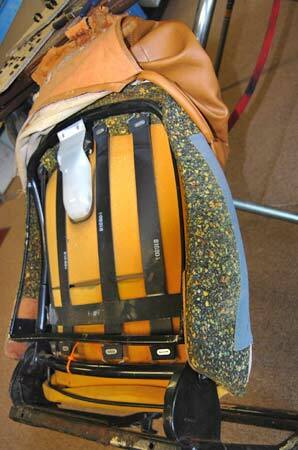 We have installed a few precut upholstery kits in our day, but we don't cut and sew upholstery ourselves. That's a specialty and more or less a lost art. On top of the special skills required to custom make seat covers, you need special equipment like a walking foot sewing machine that can handle heavy-duty automotive fabrics, as well as vinyl and leather. The Triumph TR8 we were working on had a bad driver's seat. From what we've learned, this is a typical problem in these cars. You can find good used passenger seats for sale at swap meets or for sale on eBay once in awhile, but the driver seats are "unobtainium." The driver seats took a beating. The broken Triumph TR8 seat frame had caused the vinyl seat covers to stretch and tear on the seams. Our customer car's seat frame had a bad crack and an even worse previous repair of the crack. Because of the kink in the seat frame caused by the crack, the vinyl upholstery was all stretched out of shape and had a couple of tears at the seams. It didn't look terrible and we thought that maybe the seam tears could be fixed. We contacted a vinyl repair service and they said the tears could not be fixed. A trim shop told us they could not fix the seam tears either. New seat covers for the TR8 were available from Victoria's British in Lenexa, Kansas. The price of a set was in the $600 range with shipping. We figured that it would take around 10 hours to carefully strip the old seats down and install new foam pads, insulation and seat covers. At our regular labor rate of $45 that would be at least $450 plus tax. The trim shop said they could fix our seat with new custom made upholstery for $500, less than half the cost. We proceeded to carefully strip the old seat down, taking pictures of all the important steps and all the parts and pieces involved. We stuck the parts into pieces of cardboard and labeled them. We unhooked the seat diaphragm, which was torn in several places. It would also have to be replaced and it was hard to get. We discovered that The Wedge Shop in Massachusetts sold seat diaphragms sourced from England. This added a bit to repair costs. Seats actually have a lot of small parts. New ones are available from Victoria British Ltd. Saving the old ones can save money. The shifting of the broken frame had also torn the diaphragm in several places. Note torn off corner at bottom right in photo. As we tore the seat down, we used a marker to write notes on the various vinyl panels. 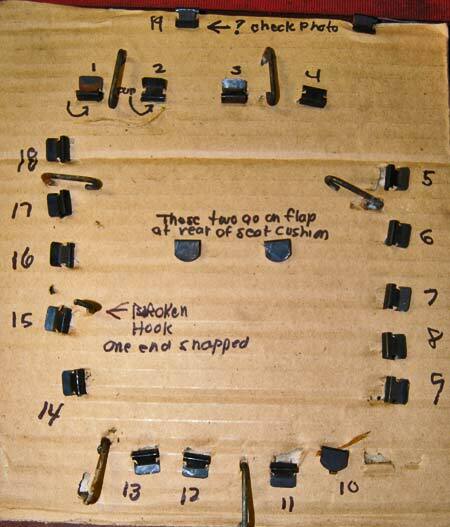 The trim shop was going to make new panels and these notes would help them figure out how things went back together. When the seat was stripped to the frame, we put the frame in the bead blaster and cleaned it up. Then, we took the frame to Vintage Works in Suamico, Wis., to get the frame welded. As usual, the crew there did a great job at an unbelievable price and even threw in powder coating so the frame will stay rust-free forever. 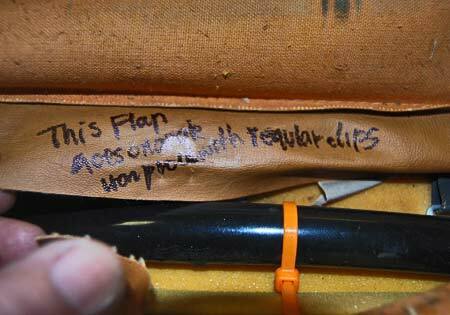 Seat teardown was done carefully, step by step, and a marker was used to make notes oh the old vinyl upholstery panels. 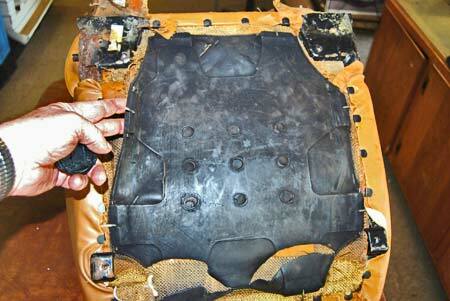 After seat covers were removed, we would be able to get the cracks and bad repairs to the seat frame repaired. With the frame taken care of, we took it and the upholstery we had removed to Red's Upholstery LLC in Bonduel, Wis. Walking into Red's is like walking back into time. Automotive trim shops like this one operated by Troy Temple and Leslie Kaschel are largely a thing of the past throughout the country. 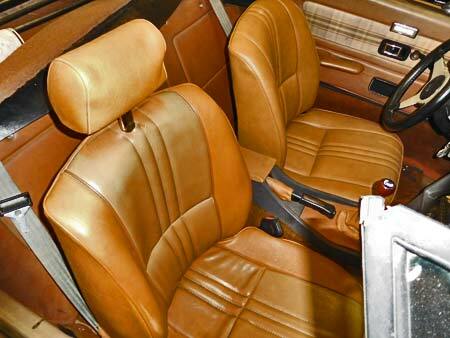 Jobs such as recovering a seat or installing a convertible top are largely lost arts. 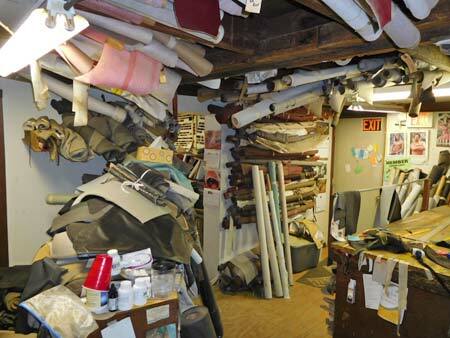 Upholstery material is sold by the yard and over its 28+ year history, Red's Upholstery Shop LLC has compiled a big inventory of fabrics for older cars. 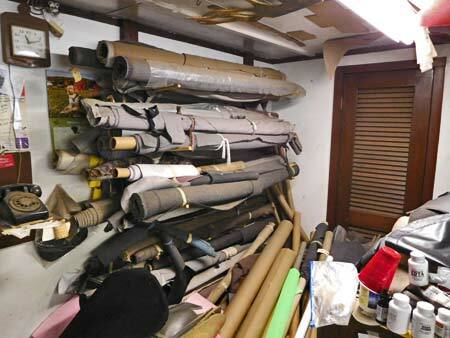 The shop is full of fabric rolls, tools and equipment. If they don't have upholstery for your car, they know where to get it. But, according to Kaschel, business at Red's has been picking up steadily for the past few years. "I guess it's getting harder and harder to find someone who does trimming," Kaschel observed. She and Temple have been working together for 28 years. 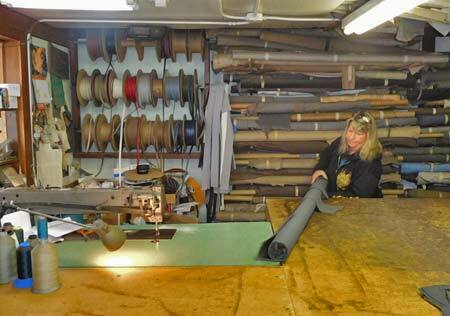 "I wish I could find young people who want to do upholstery," Kaschel said. "I'd like to get someone to do my jobs like pattern making and sewing, but so far we haven't been able to hire someone so I can semi retire." 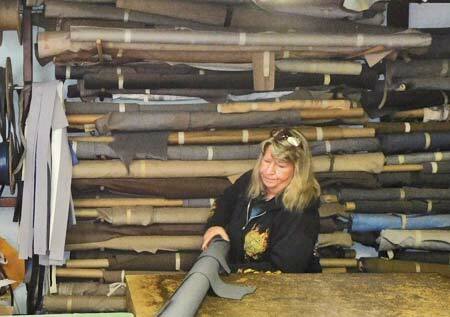 Leslie Kaschel has been working at the shop for 28 years. She would like to semi retire, but can't find any young upholsters to do her job. Kaschel said that Temple started doing convertible top installs when he was 16 years old. "He learned just by doing it over and over. Before we bought the place, there was a guy here who did tops. He worked at Chief Pontiac (an old-time car dealership) and worked here and he did tops a few hours a day. Troy just learned from him. Today, Chief Pontiac is Chief Automotive. That guy still works there, but he no longer does tops." 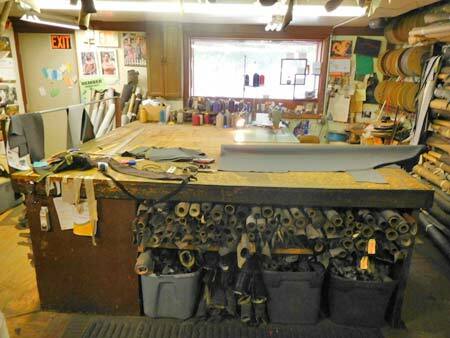 The back shop at Red's is where a lot of the upholstery work and convertible top installs are done. Dozens of big spools of different color threads are on the workbench. Reels of beading are mounted on the wall. Note long-reach sewing machine. According to Kaschel, Red's Upholstery did about 10 convertible tops this year. She said the cost of that job averages about $2,000. She said that tops are no easier or harder to do then they were years ago. "It's a good skill," she noted. "We have one customer coming in now for a new top and we have another convertible sitting out there now." One of the more interesting cars that Red's has upholstered lately was a 1932 Plymouth. "We did the whole thing," Kaschel said. "We had to rebuild all the wood in the body. It was going to be an original car and it was quite a job." Red's can do repairs to leather, vinyl, cloth and carpets. "We can do the whole car," Kaschel noted. We get $50 an hour, but when we do a whole car, it's kind of hard to charge by the hours. It usually starts at about $6,000 if someone wants to do a whole car. 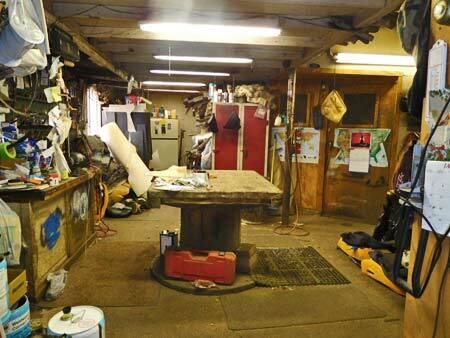 She said that the small shop packed with inventory actually has two stalls where cars can be worked on. The shop is small, but there's a large amount of inventory stored in it and some of it is rare stuff. Even the roof rafters hold rolls of fabric. 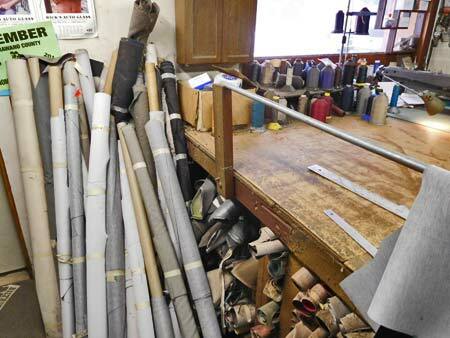 More fabrics are stored under the workbench. "We do '40s cars, '50s cars and you name it, Kaschel pointed out. 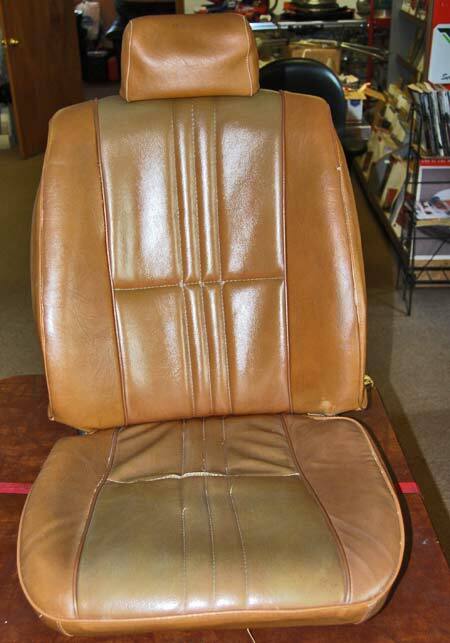 "We just did the seats in a 1965 Chrysler Imperial and they came out really nice. We've done everything you can imagine." Personally, she feels that cars like a 1920s Model A Ford are hardest to do. "The older ones are hard because you've got to rebuild everything," she explained. "There's no tack strips in them." Leslie Kaschel does pattern making and sewing and has been doing this work since she was 30 years old. Leslie knows what is on the shelves behind her and knows where to get fabrics she doesn't have. Kaschel says that she and Temple are always interested in getting new customers, although their advertising is limited to local shoppers and newspapers, but she does have one novel approach to promoting new jobs. "I advertise in the church bulletin," she said. "We don't have a Website because I'm not good on the Internet, but I have been thinking about being online so people can Google us." 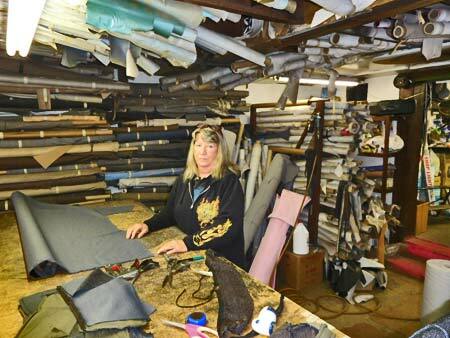 Second Chance Garage asked Kaschel where she finds the correct upholstery for classic cars. "I've got books," she said. 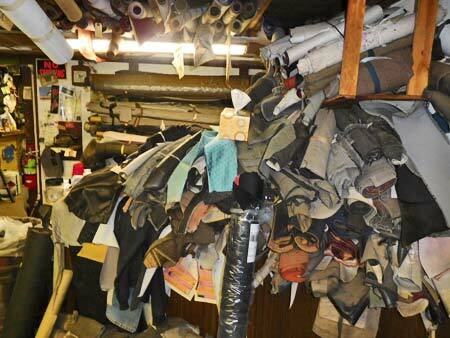 "And I get a lot of fabrics and materials for cars like the 1965 Chrysler Imperial from a place in Oregon called SMS. They're pretty good at finding what we need." 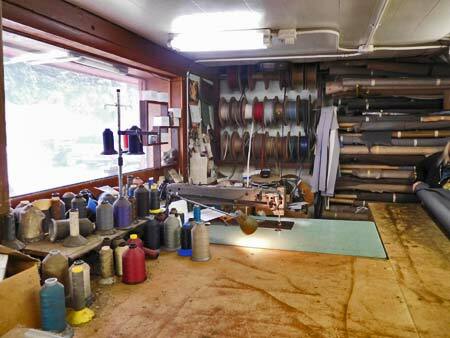 What the old-car restoration hobby needs is more shops like Red's Upholstery. Several weeks after we dropped the seat off at the shop, we got a call saying it was done and ready for pickup. The seat looked great. The problem we have now is it looks so much better than the passenger seat, we're tempted to have the second seat done. And the funny thing is, even that would be less money overall then buying and installing a kit with everything factored in. Red's stitched up the new driver's seat in this Triumph TR8.Now we're tempted to have the passenger seat done. For more articles on classic car upholstery, see How to Upholster Your Car, Classic Car Upholstery 101, Classic Car Upholstery How To: One Scenario, and Removing and Installing Hog Clips.